Last quarter's column introduced numpy and the concept of array arithmetic. This time, we'll explore a more advanced concept in numpy called broadcasting. The term broadcasting describes how numpy treats arrays with different shapes during arithmetic operations. Subject to certain constraints, the smaller array is "broadcast" across the larger array so that they have compatible shapes. Broadcasting provides a means of vectorizing array operations so that looping occurs in C instead of Python. It does this without making needless copies of data and usually leads to efficient algorithm implementations. There are also cases where broadcasting is a bad idea because it leads to inefficient use of memory that slows computation. This article provides a gentle introduction to broadcasting with numerous examples ranging from simple to involved. It also provides hints on when and when not to use broadcasting. The result is equivalent to the previous example where b was an array. We can think of the scalar b being stretched during the arithmetic operation into an array with the same shape as a. The new elements in b, as shown in Figure 1, are simply copies of the original scalar. The stretching analogy is only conceptual. numpy is smart enough to use the original scalar value without actually making copies so that broadcasting operations are as memory and computationally efficient as possible. Because Example 2 moves less memory, (b is a scalar, not an array) around during the multiplication, it is about 10% faster than Example 1 using the standard numpy on Windows 2000 with one million element arrays. Figure 1: In the simplest example of broadcasting, the scalar b is stretched to become an array of with the same shape as a so the shapes are compatible for element-by-element multiplication. In order to broadcast, the size of the trailing axes for both arrays in an operation must either be the same size or one of them must be one. In the following example, both the A and B arrays have axes with length one that are expanded to a larger size in a broadcast operation. As shown in Figure 2, b is added to each row of a. When b is longer than the rows of a, as in Figure 3, an exception is raised because of the incompatible shapes. Figure 2: A two dimensional array multiplied by a one dimensional array results in broadcasting if number of 1-d array elements matches the number of 2-d array columns. Figure 3: When the trailing dimensions of the arrays are unequal, broadcasting fails because it is impossible to align the values in the rows of the 1st array with the elements of the 2nd arrays for element-by-element addition. Broadcasting provides a convenient way of taking the outer product (or any other outer operation) of two arrays. The following example shows an outer addition operation of two 1-d arrays that produces the same result as Example 3. Here the newaxis index operator inserts a new axis into a, making it a two-dimensional 4x1 array. Figure 4 illustrates the stretching of both arrays to produce the desired 4x3 output array. Figure 4: In some cases, broadcasting stretches both arrays to form an output array larger than either of the initial arrays. A Practical Example: Vector Quantization. Broadcasting comes up quite often in real world problems. A typical example occurs in the vector quantization (VQ) algorithm used in information theory, classification, and other related areas. The basic operation in VQ finds the closest point in a set of points, called codes in VQ jargon, to a given point, called the observation. 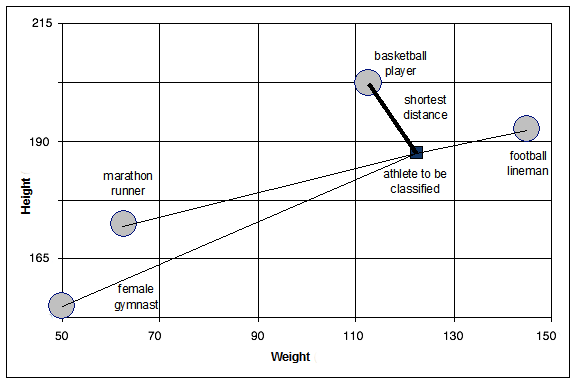 In the very simple two-dimensional case shown in Figure 5, the values in observation describe the weight and height of an athlete to be classified. The codes represent different classes of athletes.1 Finding the closest point requires calculating the distance between observation and each of the codes. The shortest distance provides the best match. In this example, codes is the closest class indicating that the athlete is likely a basketball player. Figure 5: The basic operation of vector quantization calculates the distance between an object to be classified, the dark square, and multiple known codes, the gray circles. In this simple case, the codes represent individual classes. More complex cases use multiple codes per class. Typically, a large number of observations, perhaps read from a database, are compared to a set of codes. Figure 6 illustrates how to handle this calculation with a small amount of code and without looping in Python. While this is very efficient in terms of lines of code, it may or may not be computationally efficient. The issue is the three-dimensional diff array calculated in an intermediate step of the algorithm. For small data sets, creating and operating on the array is likely to be very fast. However, large data sets will generate a large intermediate array that is computationally inefficient. The three dimensional array is a consequence of broadcasting, not a necessity for the calculation. If, instead, each observation is calculated individually using a Python loop around the code in Example 5, a much smaller two-dimensional array is used. This is sometimes more efficient. As an example, Table 1 shows that computation time for a data set of 4000 observations with 16 features (i.e., weight, height, and 14 more) categorized into 40 codes. Figure 6: Here, VQ with multiple observation points is done using broadcasting during the difference calculation by flipping the obs and book arrays on their edges. The resulting difference array is 3-dimensional. This is certainly efficient in terms of lines of code, and, for small data sets, it can also be computationally efficient. For large data sets, however, the creation of the large 3-d array may result in sluggish performance. Table 1: This table compares the run time of a pure broadcasting approach and a hybrid broadcasting/python looping algorithm for VQ calculations on a large data set with 4000 observations and 16 features categorized into 40 codes. Using the Python loop provides a speedup of 1.36 over the pure broadcasting approach. Broadcasting is a powerful tool for writing short and usually intuitive code that does its computations very efficiently in C. However, there are cases when broadcasting uses unnecessarily large amounts of memory for a particular algorithm. In these cases, it is better to write the algorithm's outer loop in Python. This may also produce more readable code, as algorithms that use broadcasting tend to become more difficult to interpret as the number of dimensions in the broadcast increases. numpy: http://numpy.scipy.org The home page has links to the download site as well as more comprehensive documentation of numpy's capabilities. Vector Quantization J. Makhoul, S. Roucos, and H. Gish, "Vector Quantization in Speech Coding," Proc. IEEE, vol. 73, pp. 1551-1587, Nov. 1985.